Edit #2: Oops, it looks like it's been brought up in later posts, but I think it's better to have everything in one post. One of the first threads I saw in the forum, and it sure helped me a lot. Close and restart Mozilla. 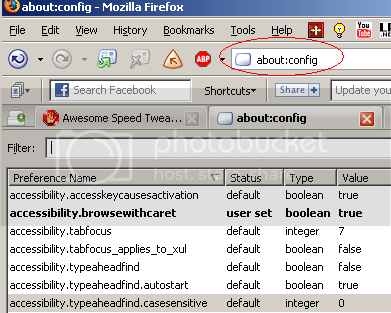 You'll have to type about:config in the address bar to make sure the settings changed. Or, you can find these same settings in about:config and type them in that way. If they're are not there, add them as new settings. You can play with these numbers. Dialup users will probably need lower numbers. Extremely fast speed broadband users can probably get away with higher numbers. I'm sure there's a point somewhere that it becomes counter productive. 1. Type about:config into your address bar and press enter. You get this page with a bunch of strange looking settings. 6. 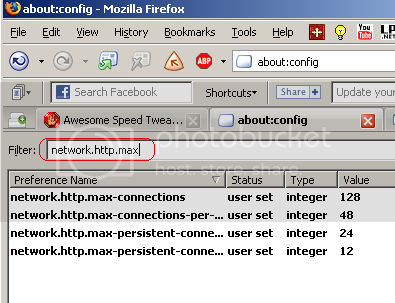 And finally, network.http.max-persistent-connections-per-server do the same thing as with the last 3; enter in 12. 7. Close firefox and all windows related to it, like download windows and such. Note these numbers are only suggestions. You can try tweaking them a little to suit your own connection. Edited by Archon_Wing, 09 October 2007 - 05:33 PM. Rights are never important until you don't have them. As an alternative to creating a user.js file, you can also type about:config in Mozilla/FireFox's address bar and edit those settings there as well. Search for those settings and then double click on them to edit. Also look for pipelining and http 1.1 and enable those. everyone should read thru it. Thanks. This is a good read. Does it work for FF 1.0? Type about:config in the address bar and hit the Enter key. Find these options, right click each one and change the default values to the ones listed below. Has Different values but do they work? It does tend to put an extra load on the site you are visiting. Just wanted to point out that these settings will work for Firefox, Mozilla, and even Netscape - basically any Gecko based browser. Also, one of the many (and I mean many) problems I've always had with IE is that it is extremely slow on a dial-up connection simply because it doesn't start rendering the page in the browser until most of it is loaded (not sure though what the trigger is). As a result of this you can be sitting looking at a blank page for quite a while. But with a Gecko browser and the settings above the page starts rendering before the page code even finishes loading. If you're on DSL or broadband then the near instant transfer of the page is going to make the actual speed of the engine rendering the page more appearent. In these cases it seems to be system specific as to which renders the fastest. Dial-up + MSIE = Stare at blank screen until it loads half of the page and decides to start diplaying it. Slowness of dial-up is readily appearent. Dial-up + Gecko = The browser starts displaying the page as soon as it starts getting code. Makes dial-up seem much faster. DSL or broadband + MSIE = The page is downloaded so fast that really only the speed of the rendering engine determines how fast you see it unless you are getting multiple pages or streams at once in which case the same goes here as for dial-up - you can be looking at several blank pages until IE recieves enough data for each to start rendering them. DSL or broadband + Gecko = Basically the same as for MSIE but percieved to be faster because any content begins rendering as soon as it's recieved. Edited by brody, 15 March 2005 - 03:39 PM. re:Please tell us what version of Windows or other OS you use. Edited by RubberSoul, 20 May 2006 - 10:44 AM. I don't have the registry entries for them either. You don't have those registry entries? Just create those! As the post you are refering to is six months old I doubt the origional posters are still monitoring it. Moreover, it is not good advice to tell people to 'just create' entries in the registry, editing the registry is something that should only be done with expert help, 'just creating' registry entries could cripple someone's PC if they do it wrong. Please try to refrain from posting unhelpful comments, especially in old threads. Thank you. As a lot of the info in the post is outdated, I updated some of it. I can't post inline pictures though; gives me an error. Try using a GIF file (.gif and .png are allowed for linked images ) instead of a JPG (if that's what you were using). JPG was turned off some time ago due to a vulnerability. Thanks. Something kept resizing those images, so I had to find a way to cut them down. But I think this will work. For people wanting a quick , and not so "involved" speed tweak for Firefox , there is a Firefox Addon which implements a lot of the tweaks mentioned , but not all . It's called Fasterfox . Note that pipelining and prefetching , cache resizing can cause a load on the site you're visiting , and stress it's bandwidth , so if you have a quick connection you may like to put up with the defaults . People on DialUp will benefit greatly from this Addon , and previous tweaks posted however . Stay safe online , help fight malware and spread legitimate well trusted security info wherever you go ! Help each other to help ourselves .